Tonight we will be able to witness a total lunar eclipse – the last in this year’s rare series of four such eclipses, which astronomers call a tetrad. This time round we have a harvest moon and a supermoon in the mix as well. It seems appropriate, therefore, to revisit one of my posts from a few years ago regarding similar celestial phenomena as recorded in the Anglo-Saxon Chronicle between the years 734 and 1140. To begin with, stars blaze across the pages of the Chronicle seven times during those 400 years. In April of 1095 the chronicler reports that “on the night of the feast of St. Ambrose nearly all over this land, and almost all the night, numerous and manifold stars were seen to fall from heaven; not by one or two, but so thick in succession, that no man could tell it.” Perhaps it looked something like the etching below, made in the 19th century of an event in 1833. There were shooting stars recorded in 744 as well, and there are 5 mentions of comets in the one hundred and fifteen years between 995 and 1110. Other dramatic celestial activity included two solar eclipses, both recorded in the first half of the twelfth century. More numerous are reports of lunar eclipses, nine of them reported, usually described as a darkened moon. But the chroniclers waxed a bit more poetic in 734 and 1117, declaring that the moon looked as if it was covered with blood. My newspaper – appropriately, The San Francisco Chronicle – tells me that “the color of tonight’s moon will depend on the gases in the earthly atmosphere, influenced by pollution levels or high clouds or volcanic dust from eruptions anywhere in the world. The color shining on the face of the eclipsed moon tonight could range from yellow to orange to red or copper to black.” The Anglo-Saxons would have known nothing about pollution or distant volcanoes. They would merely have seen blood creeping across the face of the moon. In 1106 there is a very puzzling comment about the moon: “On the night preceding the Thursday before Easter, were seen two moons in the heavens before day, the one in the east and the other in the west, both full.” Frankly, I’m having a difficult time figuring out a rational, scientific explanation for that one. Maybe someone out there has an answer. Yes, this looks like a dragon to me! This must have been the aurora borealis. Although it would have been an unusual sight that far south, it is not unknown in England even today. Certainly it would have been a frightening sight for the early English! The chroniclers usually equated such terrifying celestial events with dire earthly ones, like the comet in 1066 that presaged the Norman invasion at Hastings. We know it as Halley’s Comet. 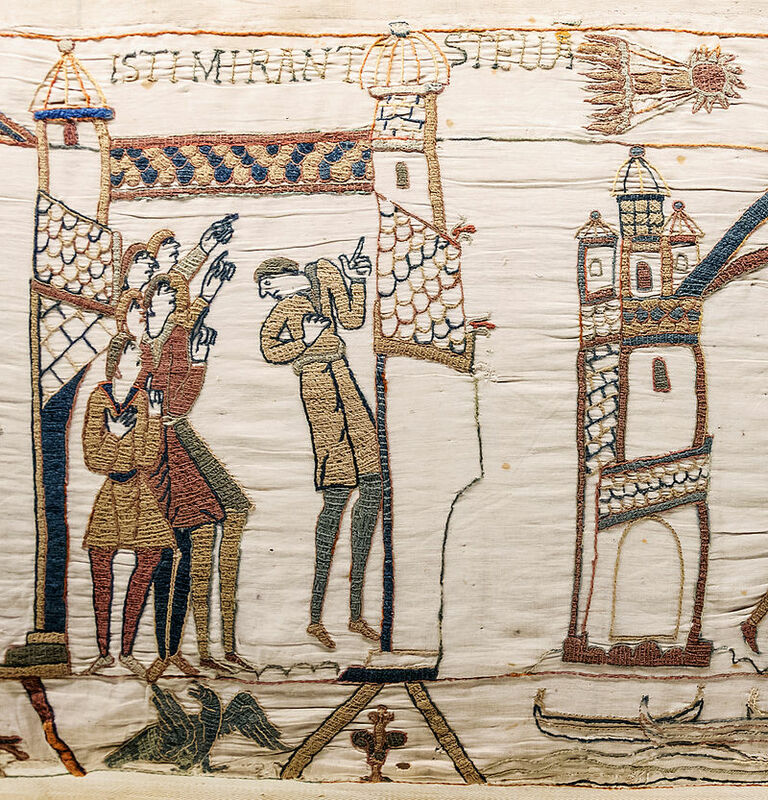 Halley’s Comet makes its appearance on the Bayeux Tapestry. My very favorite chronicle entry that equated bloody earthly events with terrifying sights in the sky is the one that opens my novel, Shadow on the Crown. A.D. 979 In this year was King Edward slain at even-tide, at Corfe-gate, on the fifteenth before the calends of April, and he was buried at Werham without any royal honors. Nor was a worse deed than this done since men came to Britain….Aethelred was consecrated king. In this same year a bloody sky was often seen, most clearly at midnight, like fire in the form of misty beams. As dawn approached, it glided away. The eclipse begins tonight on the West Coast of the U.S. at 7:11 p.m., low in the eastern horizon, and totality will last until 8:23 p.m. In the U.K. the red moon will be visible from 1:10 BST the morning of Sept. 28. This entry was posted in Anglo-Saxons, History, UK and tagged Angl-Saxons, history, Medieval, Shadow on the Crown. Bookmark the permalink. ← What Happened at Corfe in 978? And, yes, tonight’s the night. As yarn-spinning HF writers, we could almost decry modern (true) explanations behind these natural phenomena as we use them to awe the fictional populace of our imagined worlds. Still, luckily no explanation can take away our own amazement when we gaze into the night skies. Hi Inge. Glad you liked the post. I agree with you that such events still strike us with awe, just as in ancient times. They don’t fill us with terror so much, though. Thank goodness, since we have plenty of other things to fear! Lovely post. I’m afraid I slept right through and missed the blood red moon last night! Hi Annie. I missed it too. Have seen some marvelous photos, though.